Although there were some attempts before him, Ed Thorpe was the man who introduced the card counting to the world. By publishing his book "Beat the Dealer" in 1962, Thorp changed everything. The book was a huge success. In his book Thorp presented simple strategy based on card counting. His Hi-Lo counting system was simple to learn, and all the calculated numbers for the advantages were already in the book. The players had to count the high and low cards already in the game, to find out which cards were still in the deck. Based on that number, the player could decide which bets are the most advantageous for him. Thorp did complex calculations of these odds; using computers' help, and prove that some combinations are giving the dealer more advantages than some others. The players were excited, casino owners furious. They even tried to change the rules of the game. In the end, all they could do was to introduce multi-deck shoes and to keep an eye on card counters. Ken Uston is one of the famous card counters. 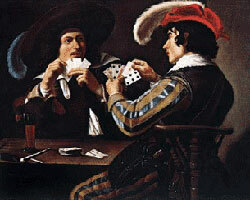 He perfected his card counting techniques and even invented a new one. He gathered the group of card counters and sent them to different tables in casino. When they established the best table for their game, they all gathered at that table using his system, and earning around 3 million dollars. Because of a wider use of the computers, the players get more opportunities for calculating their odds, which made card counting even more popular. Among many others, there were a group of students of MIT that also tried to earn serious money counting cards. Thomas Hyland also had a team of card counters. In addition, he wasn't alone in this. The IBM technician Julian Brown also used computer to help him build the system for card counting. There are still numerous card counters in the casinos all over the world. They are trying not to be noticed while counting and trying to calculate their odds, and the casino personnel is trying to notice them and to remove them from the casino. Ever ending game is continuing, until someone else gets the better idea.